Day 25: Soft Kitty, Warm Kitty, Little Ball of Fur… – The San Francisco Bay Trail: It's Closer Than You Think! A few weeks ago I saw a cat by the Bay Trail just beyond a backyard fence in Alameda. It was obviously from a good home; fat, lazy eyed with a striking red collar with tags. I thought it might be funny to capture the image and post it as “Alameda” wildlife. If you’re following this blog then you know that I did no such thing. The Beacon Day School kids were the stars of that day and their image would be honored on my blog, not the fat housecat. The sad truth, however, is that it would not have been funny and the bitter irony of the image would have come back to haunt me today. The image you see above is not just a couple of housecats loving each other. In fact, the scene was so touching, I had a hard time pulling myself away, to move on to my next mile. They were the leaders of what seemed to be a pride of five feral cats on the Bay Trail in Foster City. These two were not shy, indicative that humans feed them along the trail. They approached me as my own two childhood cats did when they wanted a scratch behind the ear; slowly and deeply purring. But these two, they were inseparable. It wasn’t until I was finished capturing a few frames that I noticed three other sets of eyes on me. They were all gazing at me from various perches along a twenty foot section of shoreline rocks. When I did notice them, these two, casually yet alertly, walked between me and the others. They were not aggressive or acting protectively but it was clear they were all together and they wanted me to know that. I felt “ten year old Kurt” rush back into my consciousness and I wanted to take one home. In fact I wanted to take them all home. However, I took solace in knowing that there is a group called Homeless Cat Network that has teamed up with Foster City to balance the preservation of existing bird habitat with humane treatment of the cat population. By spaying/neutering the adult cats along the trail, the original colony size has been reduced by 59% as of November, 2012. 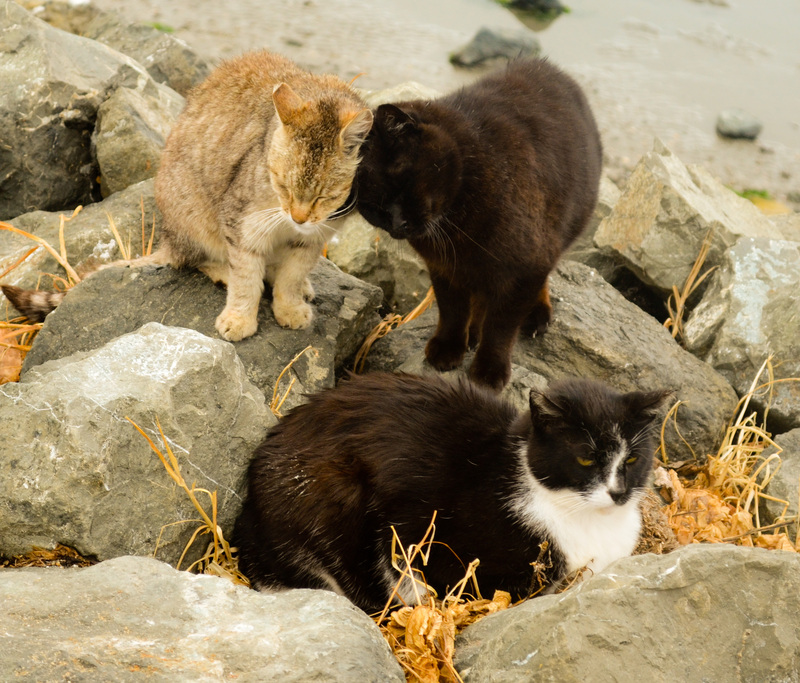 96% of the Bay Trail feral cats have been spayed or neutered through the efforts of Homeless Cat Network volunteers and local veterinary hospitals. Also, as of November, 2012, 103 kittens and friendly adult Bay Trail cats have found permanent homes. I saw more cats along this section of trail and took a flier posted under a Bay Trail sign by Project Bay Cat (this flier was the source of the above information regarding the Bay Trail feral cats). To learn more please call the Homeless Cat Network at 650-286-9013 or email ProjectBayCat@Yahoo.com. You can also follow them on Facebook: http://www.Facebook.com/ProjectBayCat. With the memory of the pride of feral cats still fresh in my mind, I approached Seal Point Park and decided to venture to the top of this shoreline hill to take in the view. What I found at the top was a permanent exhibit of stainless steel sculptures on what is called the Wind Walk. I will share a few of these images once I have my gallery completed and posted on this website. The Bay Trail extends around the outer, eastern edge of the park and the base of the west side of the park boasts a three acre off-leash dog park. There are not a lot of trees here. It is, after all, built on top of a former dump. However, what an impressive transformation it has made from landfill to park! Seal Point Park is worth the trip. I wanted to continue on when I reached my turn-off at Coyote Point this afternoon, however I made haste for the Burlingame CalTrain station about a mile and a quarter away on the other side of Highway 101. I huffed it the whole way and made it within five minutes of the whistle-stop. Walking wasn’t necessary, however, as a SamTrans bus flew by me on Peninsula Avenue with “CalTrain” emblazoned in lights. I scanned my Golden Gate Bridge 75th Anniversary commemorative Clipper Card upon arrival and was headed home by 1:08pm – with those feral cats still on my mind. Oscar will be happy I came home empty handed. Not sure how he feels about cats but I am pretty sure he prefers a one animal household.